Home / sponsors / Donate to a Worthy Cause & Get Perks! Donate to a Worthy Cause & Get Perks! Soap & Water’s goal is to launch a responsibly manufactured “green” personal care brand with 100% of profits donated to EarthEcho International and Water.org. Our products are developed and manufactured with the environment and sustainability as a priority. The formulations contain essential oils and organic and/or naturally derived ingredients. Free from Phthalates, Sulfate and Paraben. No animal testing. We are a long time manufacturer of all things fragrant and beautiful and activists for clean water for all! Our CEO, Jill Belasco, has been a “water” person for a few years and wanted to find a way to fund, on an ongoing basis, organizations that are successful at environmental programs in the US and globally. Because we have an on-going business in the same category, R & D, product development, sales, back office and manufacturing can all be handled by our current infrastructure. What we don’t have is a budget for marketing and advertising. We have strong retail partners that are ready to jump on board with us but we need to have a comprehensive marketing strategy to launch the product. We are looking for $250,000 to help us launch the product in Fall of 2014. We will use any money raised in the campaign solely for the promotion of Soap & Water. Contributors to our campaign will get wonderful treats for helping us (we do make some amazing products) but the best reward is that you will help us launch an environmentally, socially conscious brand of beautiful personal care products that will, in turn, fund successful programs that help provide clean water and access to sanitation throughout the world. We are very careful when we choose the organizations and programs we support and are pleased to partner with EarthEcho International and Water.org. 100% of profits from Soap & Water will go to organizations like these. Our team has been in this business since 1994 – and we love it. We’ve been honored by our industry on multiple occasions for product excellence and marketing success. We know how to make beautiful, commercially successful products. So, you can imagine how excited we are to be working on something that can change the world! It always feels good to do good – and now you can feel good, too. We so appreciate your help – even if financial support isn’t possible. Please tell your friends and family about us. We are going to give it our all – it is so important to us to use our organization and our skills to help others. Please be sure to use the Indiegogo share tools. 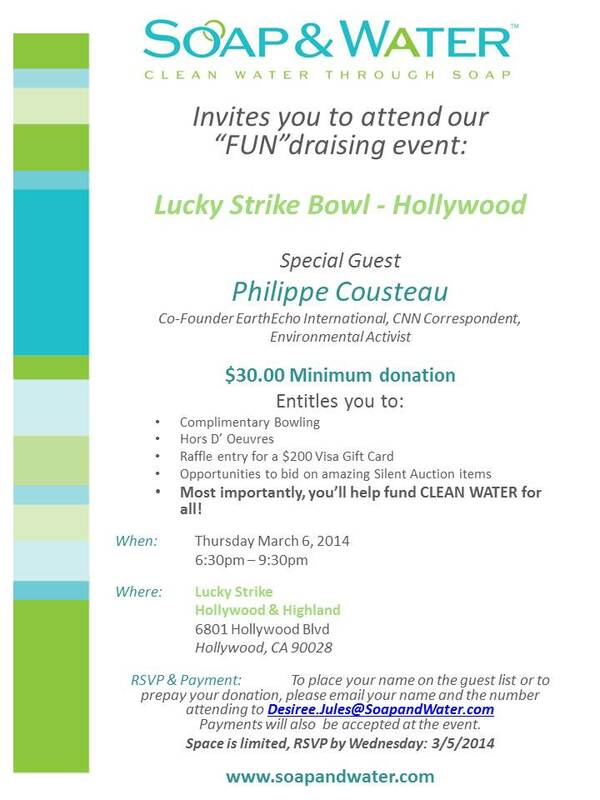 We’re in the process of collecting merchandise for an event being held on Thursday, March 6, 2014, and I’m writing to request your assistance in making the Soap & Water FUNdraising event a success. By donating an item, you’ll be making contribution that will help fund CLEAN WATER for all! To learn more about the global mission to fund CLEAN WATER for all and the FUNdraising event, please visit www.soapandwater.com. Thank you so much for supporting our worthy cause!